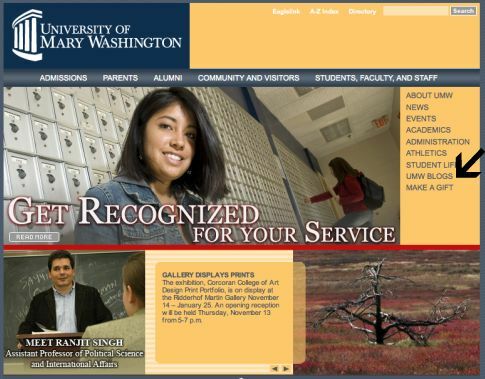 Well, after almost a year and a half of solid publishing and more than 30,000 posts, UMW Blogs has finally got frontpage link real estate on the UMW Homepage. I guess we’re kind of official, now if we could just get the homepage to feed in posts from the UMW Blogs community so that it wouldn’t be so painful to look at. A recent post on Reefer Madness on UMW Blogs would provide a much needed boost for the brochure logic of our site. This entry was posted in UMW Blogs and tagged blog, blogs, community, umw, UMW Blogs. Bookmark the permalink. 15 Responses to UMW Blogs: It’s official?! Congrats Jim. Your model is one I am trying to push at my institution. Your work and success will benefit us all greatly. I, too, referred by university to UMW Blogs and to you in hopes that there will be agreement to move forward with something similar. Let us know if we can help you in any way. Also, glad to have found your blog through the link, consider me subscribed. uh-oh. Does this make you THE MAN??!! Awesome to hear! When I went there, I didn’t even know about them, and it would have been great to know. So glad that you all are doing some amazing things, and pushing the tech envelope. Is there any collaboration with the CompSci department, or outside people? I think that would be really neat, and get students working on real projects. We have always been the MAN! And now we just have the huge stick to swat people with! I agree, and after seeing the awesome work you are doing with Django, not to mention your post a day for a month in November, I wish you were still at UMW. But you see to be an alumni making good by making the most of these tools and applications, congratulations! After researching WordPress MU today, all links lead to Jim! We are looking to implement this at our school, the style and grace of UMW blogs is definitely a goal to shoot for. btw that edit timer is intense! You may be in luck. Some of the software that I’m planning is going to be really useful for communities of any kind; planned for tech communities, but UMW is a fine candidate as well. Also, I have been wanting to do a good Fredericksburg/UMW event calendar (it’s severely lacking) for a while, and I’m a good designer away from launching one. I’m not in Va anymore, but I still want to create some cool stuff for the Community there, because it was lacking, and I know it can be a great one. Congrats. Real punks ship… and this is shipping with style! Damn, I can’t even do that right 🙂 And andrea_r (proprietor of WPMu Tutorials) is the real go to person for WPMu, I can’t count the times she has helped me out of a jam on the forums. She rules. This is really great news! Way to change things — your way!